Treeshrew (or tree shrew) is the common name for any of the small, roughly squirrel-shaped mammals comprising the order Scandentia, characterized by generally long tail, five functional toes on the forefeet, complete auditory bullae, large eyes, pointed snout, and lacking the prominent vibrissae (whiskers) of squirrels. It was long been debated whether they are primitive primates (order Primates) or belonged to the now-abandoned order Insectivore, but currently treeshrews are placed in their own order, which variously is considered to have one extant family Tupalidae or two (with the addition of Ptilocercidae), five genera, and twenty living species. Treeshrews are found in tropical forests of southeast Asia. Although called treeshrews, scandents are not true shrews and not all species are necessarily arboreal. Treeshrews serve important roles in the ecosystem, consuming fruit, seeds, insects and other invertebrates (spiders, centipedes, millipedes, earthworms, etc), and in some cases even small vertebrates (small mammals and lizards), and serving as food for snakes, birds of prey, and various wild cats, such as leopard cats and clouded leopards. They also may play a useful role in seed dispersal for plants with soft, juicy fruits. For humans, the diurnal behavior of most species allows them to add to the joy of observing them in nature. In external appearance and size, tree shrews resemble squirrels (order Rodentia, family Sciuridae), including a tail that is generally long and in many species heavily furred (Myers 2000). However, they lack the long whiskers of squirrels and have five functional toes on the forefeet, rather than the four typical of squirrels (Myers 2000). 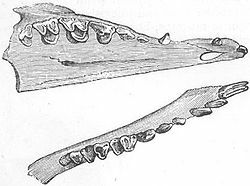 The snout also is more pointed, similar to that of a shrew (Morris 2003). The tail of different species actually can range significantly in terms of amount of fur, and can either be fully-furred, slightly hairy (smoothtailed tree shrew) or completely naked (pentailed tree shrew). Treeshrews range in size from 8 to 16 inches (20 to 40 centimeters) with the tail making up half of this length. The average body length minus the tail is 7.7 inches (19.5 centimeters) and the average body weight is 142 grams (GI 2102). The terrestrial species tend to be larger than the arboreal forms, and to have larger claws, which they use for digging up insect prey. Treeshrews are omnivorous, feeding on insects, small vertebrates, fruit, and seeds. Most are diurnal, although the pen-tailed treeshrew (Ptilocercus lowii) is nocturnal. In some species, these animals are solitary, while in others, the animals live in pairs or in small family groups (Myers 2000). They mark their territories using various scent glands, or urine, depending on the particular species. Treeshrews are typically monogamous (GI 2012). Female treeshrews give birth to up to three young after a gestation period of 45 to 50 days, in nests lined with dry leaves inside tree hollows. The young are born blind and hairless, but are able to leave the nest after about a month. During this period, the mother provides relatively little maternal care, visiting her young only for a few minutes every other day to suckle them. Treeshrews reach sexual maturity after around four months, and breed for much of the year, with no clear breeding season in most species (Martin 1984). Tupaia tana has been known to spend little time in parental care prior to weaning (less than five minutes every other day to nurse the young) and yet after weaning spending a lot of time with the young (Miller 2007). The name Tupaia is derived from tupai the Malay word for squirrel (Nowak 1999) and was provided by Sir Stamford Raffles (Craig 1849). Among other things, they eat the fruit of Rafflesia, a genus of parasitic flowering plants found in southeastern Asia and named after Sir Raffles, the leader of an 1818 expedition into the Indonesia rain forest where they were found. In 2008, researchers found that the pen-tailed treeshrew in Malaysia was able to consume large amounts of naturally fermented nectar of up to 3.8% alcohol content the entire year without having any effects on behavior. Treeshrews have a higher brain to body mass ratio than any mammals, including humans (GI 2012). Treeshrews make up the families Tupaiidae, the treeshrews, and Ptilocercidae, the pen-tailed treeshrews, and the entire order Scandentia. There are 20 species in 5 genera. The classification of treeshrews has been, and remains, controversial. Some argue that they are primitive primates, and properly belong in the Primates order. However, treeshrews and primates do not appear to share any derived characteristics (GI 2012). Genetic analysis do place them in proximity to the primates and they have been used as an alternative to primates in experimental studies of myopia, psychosocial stress, and hepatitis (Cao et al. 2003). At one point, treeshrews were placed in the Insectivora, a now-abandoned biological order. They were moved to the Primates order because of certain internal similarities to the latter (for example, similarities in the brain anatomy, highlighted by Sir Wilfred Le Gros Clark), and classified as a primitive prosimian. However, recent molecular phylogenetic studies have strongly suggested that treeshrews should be given the same rank (order) as the primates and, with the primates and the flying lemurs (colugos), belong to the clade Euarchonta. According to this classification, the Euarchonta are sister to the Glires (lagomorphs and rodents), and the two groups are combined into the clade Euarchontoglires (Janecka et al. 2007). Other arrangements of these orders have been proposed (Pettigrew et al. 1989). The fossil record of treeshrews is poor. The oldest putative treeshrew, Eodendrogale parva, is from the Middle Eocene of Henan, China, but the identity of this animal is uncertain. Other fossils have come from the Miocene of Thailand, Pakistan, India, and Yunnan, China, as well as the Pliocene of India. Most belong to the family Tupaiidae, but some still-undescribed fossils from Yunnan are thought to be closer to the pen-tailed treeshrew (Ptilocercus). Named fossil species include Prodendrogale yunnanica, Prodendrogale engesseri, and Tupaia storchi from Yunnan, Tupaia miocenica from Thailand, and Palaeotupaia sivalicus from India (Ni and Qiu 2012). ↑ K. M. Helgen, "Order Scandentia," pages 104-109 in D. E. Wilson, and D. M. Reeder, eds. Mammal Species of the World, 3rd ed. (Baltimore: Johns Hopkins University Press, 2005). ISBN 9780801882210. Cao, J., E.-B. Yang, J.-J. Su, Y. Li, and P. Chow. 2003. The tree shrews: Adjuncts and alternatives to primates as models for biomedical research. J Med Primatol 32: 123–130. Retrieved July 24, 2012. Craig, J. 1849. A New Universal Etymological Technological, and Pronouncing Dictionary of the English Language. London: Routledge, Warnes, and Routledge. Genome Institute (GI). 2012. Tupaia belangeri. The Genome INstitute at Washington University. Retrieved July 24, 2012. Helgen, K. M. 2005. Pages 104-109 in D. E. Wilson, and D. M. Reeder, eds., Mammal Species of the World, 3rd ed. Baltimore: Johns Hopkins University Press. ISBN 9780801882210. Janecka, J. E., W. Miller, T. H. Pringle, F. Wiens, A. Zitzmann, K. M. Helgen, M. S. Springer, and W. J. Murphy. 2007. Molecular and genomic data identify the closest living relatives of primates]. Science 318: 792–4. PMID 17975064. Martin, R. D. 1984. Tree shrews. Pages 408-413 in D. MacDonald, The Encyclopedia of Mammals. New York, NY: Facts on File. ISBN 0871968711. Miller, E. 2007. Tupaia tana. Animal Diversity Web. Retrieved July 24, 2012. Morris, M. 2003. Tree shrews: Order Scandentia. Angelfire. Retrieved July 24, 2012. Myers, P. 2000. Scandentia. Animal Diversity Web. Retrieved July 19, 2012. Ni, X., and Z. Qiu. 2012. Tupaiine tree shrews (Scandentia, Mammalia) from the Yuanmou Lufengpithecus locality of Yunnan, China. Swiss Journal of Palaeontology 131(1): 51-60. Retrieved July 24, 2012. Nowak, R. M. 1999. Walker's Mammals of the World. Johns Hopkins University. ISBN 0801857899. Pettigrew, J. D., B. G. Jamieson, S. K. Robson, L. S. Hall, K. I. McAnally, and H. M. Cooper. 1989. Phylogenetic relations between microbats, megabats and primates (Mammalia: Chiroptera and Primates). Philosophical Transactions of the Royal Society of London, Series B, Biological Sciences 325(1229): 489–559. Retrieved July 24, 2012. This page was last modified on 29 December 2014, at 17:28.